Height: 40.54 m / 133 ft. Maximum Static Hook Load: 390,000 lbs. 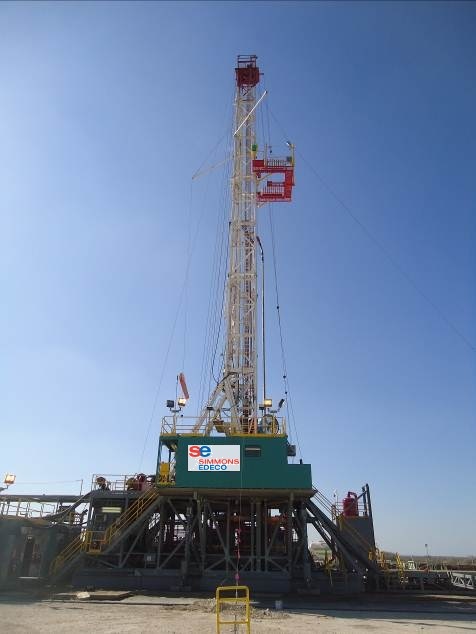 Drill Line Size: 1 1/8"
Input Power: GE Model 752 Series Traction Motor 1,000 hp. KB to the Ground: 3.81 m.
Maximum Slip Table Capacity: 390,000 lbs. Maximum Set-Back Capacity: 350,000 lbs. Moving System: Pull Type with Independent Hydraulic Moving System for Mud Tanks. Diameter Ranges from 4" to 6 ¾"